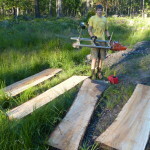 Metsami Creations utilizes an Alaskan Chainsaw Mill to make custom cuts in logs up to 30 inches in diameter. 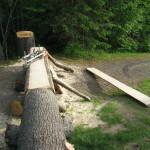 Although average cutting speed is roughly 50 board feet per hour, chainsaw mills are fit for completing custom cuts on oversized timber or urban timber unfit for a band saw mill. 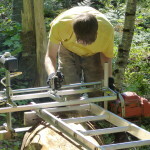 A Alaskan Chainsaw mill is guide jig that clamps on to the bar of a large chainsaw. 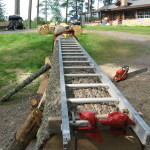 The process to mill a log with the chainsaw mill requires a slabbing rail (we use a 15ft ladder) to attach to the top of the log to guide the first cut. After the first cut is made the guide jig rests on the first cut to guide the next. 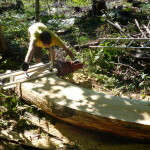 The mill is adjustable from 1/2 inch to 12 inches. To edge boards or and cut beams, we use a vertical milling attachment. 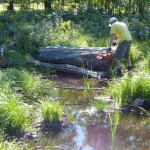 Milling old growth white cedar log in swamp. Metsuri! 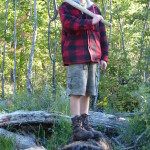 Me standing on white cedar log. 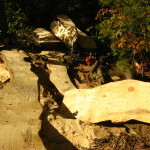 First cut into white cedar log. Second cut is guided by flat surface of first cut. 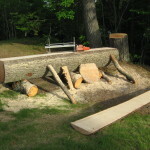 Attaching slabbing rail to curved white cedar log. First cut along slabbing rail. 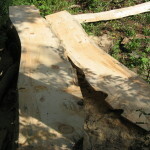 White cedar is very dry and dusty wood to mill. 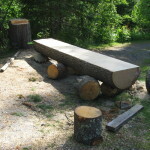 Unique curved white cedar slabs. 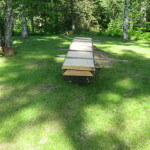 Rail attached to make first cut. 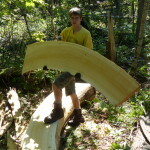 First slab from white pine log. 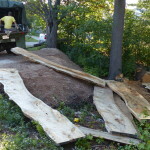 Random white pine slabs from two logs. 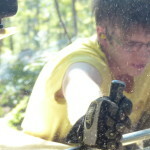 Making last cut before winching slabs to the landing. Loading the slabs into the M35A2. 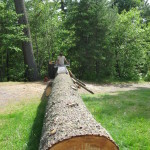 Giant white pine log at Pinecrest Resort. 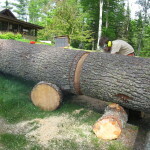 Bucking white pine log into 14ft sections. 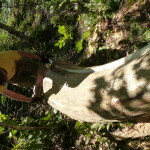 Slabbing rail attached to white pine log. First slab has been cut. 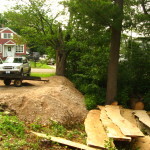 Side view of the first cut. 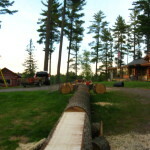 View of log, cabins, and old growth white pines. 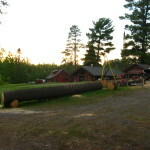 Side view of the white pine log and cabins. 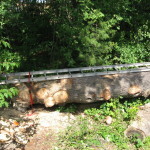 White pine log after cutting third slab. 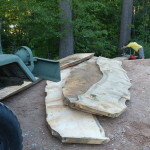 Two nice white pine slabs.